Yesterday, I saw/experienced the show “D&D Yoga”, in the Toronto Fringe Festival. From D&D Yoga’s Facebook Page. This is immersive theatre at its most experimental and Fringiest. You should see it. Other people have written reviews about the show, and I’m specifically going to cover the immersiveness of it. I haven’t done much yoga, but the meditation/yoga I’ve done has always been about bringing your mind to a place of suggestiveness and relaxation, that particularly allows you to feel, temporarily somewhere else. There’s the typical “imagine yourself on a beach” or “imagine yourself in a forest, with birds chirping”. These are mainstays of meditative/yogic experiences. In a typical D&D setup, this immersive, imagination-provoking information is delivered while everyone is sitting, with their eyes open, probably with a beer in hand, while at least one person is looking over their character sheet and doing needless math, and another is requesting the volume go up on a Skype connection. 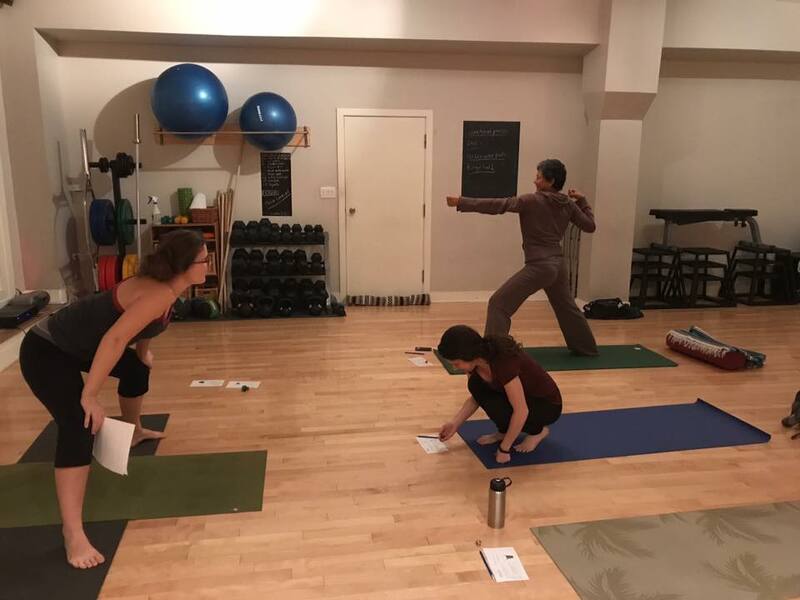 The most immersive parts of the experience were when the yoga instructor was guiding us through poses related to our dungeon crawl: pushing a boulder out of the way, climbing a wall, shimmying through a crack in the rock, hiding against a wall from goblins, trying to escape from flesh-eating vines (I rolled a Nat 20 and got to notify the party early). This made me wish for more narrative exercise experiences, where my imagination is engaged while my body is being used. When I run or play D&D sessions, it’s highly banter-y. People interrupt with insane ideas, there are jokes, the tone is that people are encouraged to try to do things and it’s the job of the DM to let them know if they shouldn’t. You’re encouraged not to self-censor. This felt at-odds with an experience where a Dungeonmaster/Yoga Instructor is guiding you through poses as you’re doing a dungeon crawl. In typical D&D, you could say: “Instead of rappelling down, I’m going to use my bag as a parachute”, and it’s up to the DM to come up with a roll for that, while everyone laughs. For this type of show, it would be an un-yogic experience to pause and have the Dungeonyogamaster come up with a suitable roll and pose for you. Just by itself, the one-shot campaign designed for the show is quite clever. Like I said above, it has to feel interactive without too much player intervention, and it even includes a clever twist in the end, at least in my playthrough. It makes me want more immersive theatre exercise. More! I demand anyone that reads this make more in that genre! 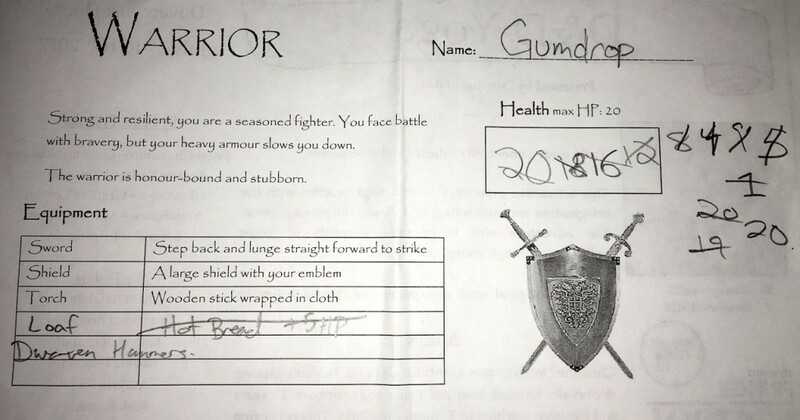 We were given a class in the beginning (Warrior, Rogue, or Mage). Each had a separate attack yoga pose, as well as out-of-combat yogic abilities. (I’m not joking; this was tightly done and I’m giggling at how literally hilarious this design is). One awkward thing was that we had to roll our dice, on the ground, before doing our attack pose. I kept forgetting to roll the dice before, and when we went through to see how everyone did, I had to reach down and roll quickly. It makes me wish for some sort of in-hand dice. This entry was posted in commentary, theatre. Bookmark the permalink.